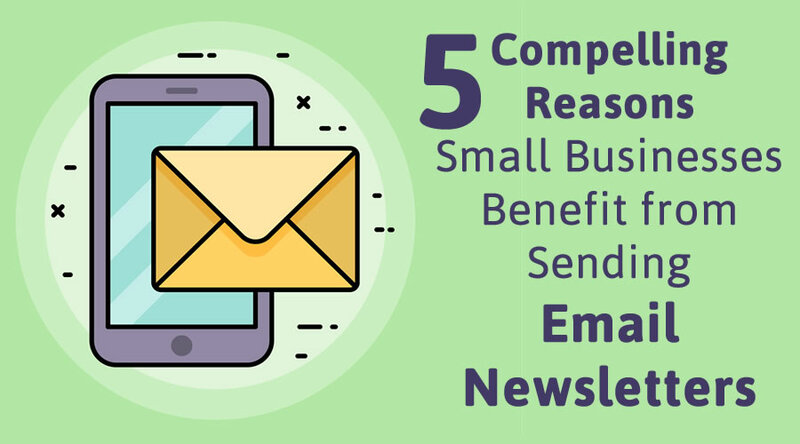 Most people selling or marketing into the enterprise IT space see the value in having a regular newsletter with valuable content sent to their key contacts. However they know how hard it is to produce a quality newsletter that their contacts will value. It’s a build or buy choice and I can make that an easy ‘buy’ choice! I can provide an individual with a turnkey, managed Enterprise IT Newsletter service for about $33/week. For a team of five, I provide additional features, a custom website, and up to 1000 contacts per rep for about $22/week per team member. Those approximately 22 articles were the most clicked-on articles from the previous week’s newsletter that was sent to 50k+ subscribers of “IT News and Events“, which has been in production since 2011. How to get started? Make a spreadsheet with up to 500 of your professional IT contacts who would find that newsletter useful. Upload that spreadsheet into the service and use the system to send a welcome message (opt-in or opt-out) to your new subscribers. Each week your subscribers will receive a tailored email from your email address with just the topics selected by that subscribers. The newsletter will have a banner with your name, contact info, picture and logo. There is great value in being the provider of useful information to your key contacts! You can sign up as my subscriber and experience the newsletter as would one of your contacts. See this blog post. sections include: CxO, Servers, Storage, Networking, Security, Cloud, Risk, Technology, Backup, Bitcoin, DevOps, PM, AI, BI, ERP, CRM, HR, Humor, Operations, IoT, etc. every sales rep I know has boxes of card from customers, partners, prospects etc. Go through those, removed unneeded columns, and determinate the people you want as key contacts and add them as your subscribers! This effort will not only improve your visibility in the market, but it will set you up well for whatever new position you take! Here’s a quick summary of what the Managed Enterprise IT Newsletter As A Service costs. Brooke Bayer writes in Business 2 Community, “Developing an email marketing plan is a great tool to not only nurture your customers through the customer journey and to stay top of mind, but also a great tool for maximizing sales and customer loyalty. This tactic is used to build on that existing relationship and providing valuable information. Email marketing also allows you to target a specific audience, which is known as segmentation, based on your customer personas. The audience segments allow you to send the right content, at the right time, to the right people. Content promotion – people spend hours in their emails on a daily basis, which makes this a great outlet to share your most recent blogs, webinars, podcasts, etc. Salesforce writes, “Want to boost your e-commerce sales, but don’t know where to put your marketing budget for your next campaign? Consider this: 64% of companies consider email marketing the most effective marketing channel. Even with numerous new marketing channels — such as social media, direct messaging, mobile app marketing, and so on — email marketing still provides a remarkably effective solution. 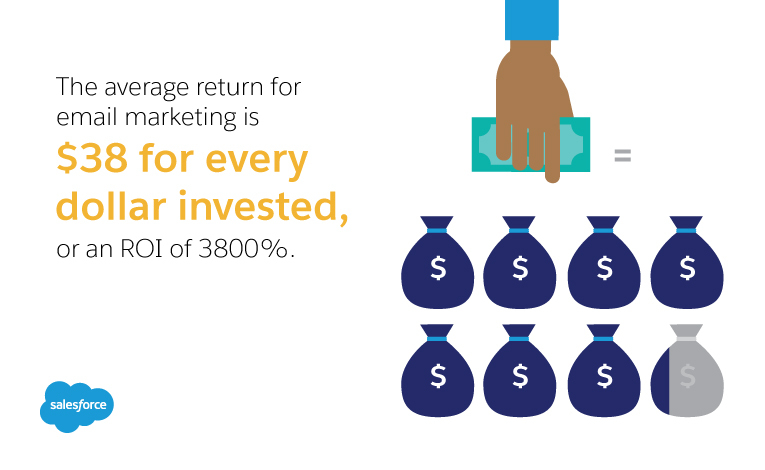 Additionally, the relative low cost of implementation associated with email marketing makes for an astoundingly high return on investment; the average return for email marketing is $38 for every dollar invested, or an ROI of 3800%. Jomer Gregorio writes in an article for “Business 2 Community, “The digital marketing landscape has significantly evolved for the past recent years, with new and more advanced platforms, tools, and strategies being introduced for different marketing objectives and agendas year by year. However, these rapid advancements don’t leave out the more than a decade-old strategy which many digital marketing experts believe is still very effective today – email marketing.